I've always been curious about beliefs, how they're formed, and how they impact our lives. As someone with great compassion for the human experience, I’ve literally spent a lifetime wondering about things like these. When it comes to beliefs, it’s still a mystery to me how few of us take the time to become aware of, question, or challenge our beliefs. So I challenge you now to reflect on the following. Do you know where they come from? 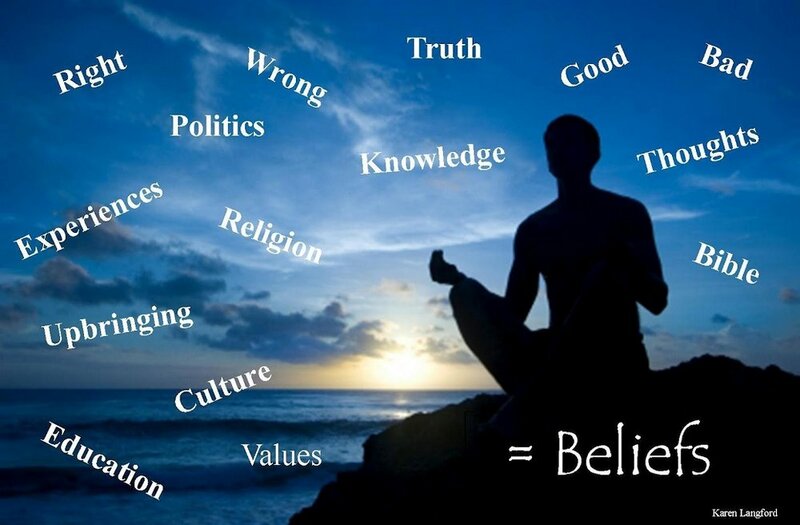 Are your beliefs working for you? More importantly, do they really belong to you? And are they moving you forward in manifesting your hearts desires? Or are they keeping you stuck in limitation and lack. If so, you may be in need of some belief relief? What are beliefs really but thought forms that we accept as truths about ourselves that we've culled from our childhoods and life experiences. According to neuroscience, beliefs are the building blocks that create our physical reality yet most come from our unconscious thoughts. If they are the foundation of every thought, emotion, word and action then they also affect our perceptions and influence our perspectives. And, according to Dr. Bruce Lipton, author of “The Biology of Belief,” beliefs are powerful enough to affect the cells and our physical bodies. So where do beliefs come from? Are they passed down through families, societies, religions and cultures? Or are they the ones we make up as we go along and file away in our left brain? How many of you have been encouraged to think outside of the box, challenge beliefs and seek your own inner truth? Modern society simply is not set up that way. Although these overarching beliefs affect who we are and how we experience the world, it’s the beliefs we form about who we think we are that seem to have the smallest voice and the strongest hold. Just ask your inner critic. I bet it knows. Children are incapable of separating their actions from who they believe they are. When a parent calls a child’s behavior “bad,” the child perceives he or she is simply because they don’t know the difference. Despite parents’ best efforts most of us grow up with a million false beliefs about ourselves and who we really are. Every life experience creates some sort of inner belief. For example if you get your heart broken the belief is love is not safe. If your parents fought a lot, the belief is relationships are wrought with chaos and fighting. The list goes on and on and on. So what happens to these beliefs we file away? Some are too painful and go directly to the unconscious mind and the outcome is what I call the pit of shame -- that hidden place where we store these negative beliefs about who we believe we really are and how safe or unsafe we belief life is. It becomes part of our shadow side and the one we project onto every person, place or thing we encounter. We are creators, whether you know it or not and beliefs form the basis of conscious thought, So what if unconsciously we repeat the same story and experiences over and over again for the sole purpose of either confirming or challenging our beliefs and discovering the truth of who we really are. Say a relationship ends. The belief may unconsciously be that you’re unlovable. And, oh look, you've just confirmed that belief. Or, better yet, what if you unconsciously sabotage your relationships because you once got your heart broken? Is it possible you are unaware that just because it happened once, the belief it's going to happen again? Day in and day out those beliefs are flying around everywhere affecting everything until we step take the time to do the work of belief relief. One of my favorite quotes is the definition of insanity: Doing the same things the same way over and over again and expecting a different outcome. You will never have your desired outcomes until you empty your pit of shame and examine what today is real and those you need to release. So many are beginning to see the old beliefs and ways of living are no longer working or serving them. Call it a consciousness awakening or a wake-up call but it’s here and now and happening to us all. I think it’s a call to get out of our heads and into our hearts (heartmind) and remember who we really are -- as divine sparks of creator energy -- not who our head thinks we are. As for me, I’ve been a truth seeker for as long as I can remember. From a very early age, I simply could not accept that life was the way it was and that someone outside of myself was going to tell me how to live. Go to school, get a job, get married, have a family and live as unhappily as the adults around me. No thanks. Not me. I have bigger things to attend to. I just knew there had to be some greater purpose to my life. That is when I started my journey long long ago. This is my passion and this is my purpose and I’m here to assist you. And still I do my own belief relief, empty my pit of shame, examine my limiting beliefs and say goodbye to them. I encourage and invite you all to do the same. Choose the ones that support who you really are, the ones that don’t hold you back. Choose the ones that free you to be who you really are and create the life you’ve always wanted to live. Always remember beliefs are energy. They can be transmuted or released. So why not gift yourself with some belief relief?